Creating a Google My Business listing can be tough with the number of changes that take place on the Google My Business platform. In this article, I am going to teach you how to create a Google My Business Listing in 2018! I hope you really get value from this article. So, what is a Google My Business listing? A Google My Business listing is the local listing that shows up on the side of the search results. Or, if you are searching for a local service, it is the Google Map Pack that shows up for local businesses in the area. 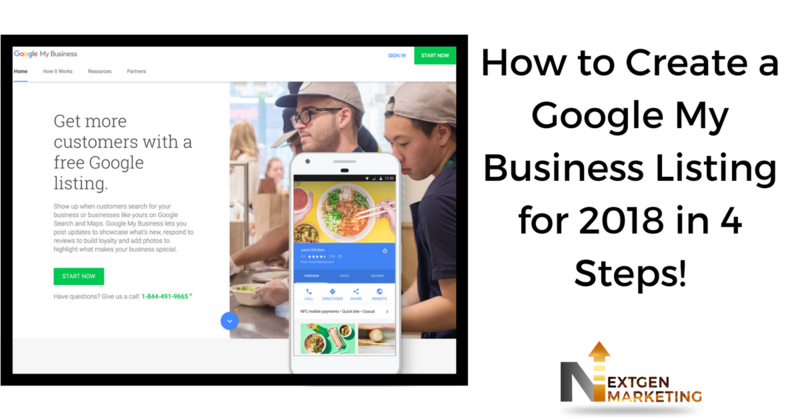 So, what are the steps to creating a Google My Business listing in 2018? Schedule A One on One Strategy Session! You’ll need a Google account to create your Google business listing on Google My Business, so if you don’t have a Google account yet, it’s definitely time to get one! Go to https://www.google.com/business/ and click ‘Start Now’ to start your new Google My Business listing. If you don’t already have a Google account, you will need to create your new account now, but if you already have a Gmail Account, go ahead and sign into that account. Once you’ve signed up or signed in, you’ll be prompted to put in the name of your business. Just type in your business name to find it. If your business doesn’t already have a profile but does show up in the results list, you’ll need to tick a checkbox to confirm that you have the authorization to claim it. If your business doesn’t show up in the results at all, you’ll need to click ‘Create a Business With This Name’. You will then be prompted to fill out information regarding your business. Including address, business phone number, type of business you run, and website! If you do not have a website, I definitely recommend having a website. Go to Web Design to see how we can help with your web design project! Google has a couple different methods to verify that you’re the business owner. Method 1: The Postcard: Google will send you a verification postcard to the address you’ve given for your business. This postcard will take 1-2 weeks to arrive; once it does, it will contain instructions on how to verify that you are authorized to claim your business. You do not need to wait for the postcard to arrive to start updating your account– you can get started right away! Method 2: Phone Call: Google will give you a call to the business number you have on file with Google. They will give you a verification code to input when prompted. Method 3: Text Message: Same as a phone call but the verification code will come as a text to the business phone number you have on file with Google! Setting up your business information is pretty easy and intuitive. Add photos, more subcategories for your business, a website, an appointment URL, your opening and closing times, and edit any details you need to. You can edit all of the information about your business under the info tab, then you will add photos and videos under the photos tab! See below for images of where those tabs are. Our digital marketing agency can help you get your Google My Business set up correctly and optimized to show up in the Google Search Results for your service. NextGen Marketing is your Akron Digital Marketing Agency. We handle everything from Akron Web Design, Akron SEO, Video Production Akron, and Akron Social Media Marketing. But, it’s not just the Akron area we focus on. We service clients all over the United States for their Web Design, SEO, and Social Media Marketing needs! Don’t hesitate to give us a call or fill out our contact form about your project today! We look forward to hearing from you.